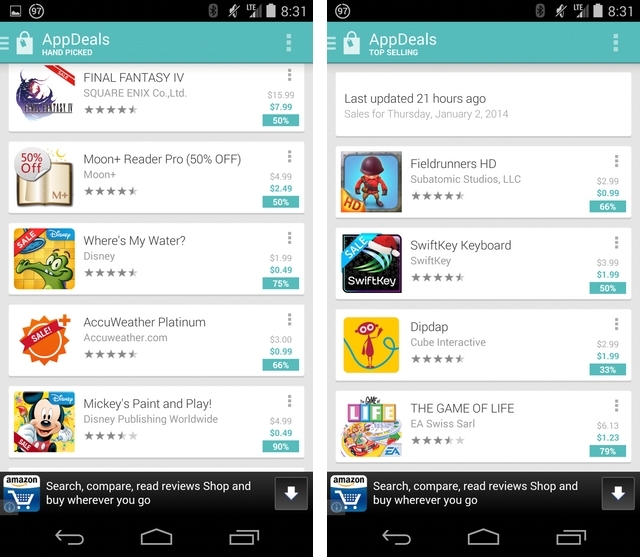 Reddit Sync‘s developer had a bit of extra time on his hands during the holidays, so he whipped up a quick app called AppDeals to find the best sales on the Play Store. As it stands, the app is fairly simple, but works well: open it to find a list of Top Selling paid apps currently discounted; open the left-side hamburger bar to see a hand-picked list of other deals, either apps or games. The app takes liberties with its design — it looks almost exactly like the Play Store itself — with a Cards layout and sliding menu, but that’s not a criticism. It’s simple and it works, and I’ve saved (or spent, depending on how you look at it) lots of money as a result. The dev is planning to add a Wish List feature in the near future, and will be fleshing out the app’s capabilities as well. In the meantime, check it out if you’re looking for the best prices on top-tier paid Android apps.